Stevens – Tank or Motorcycle? I finally received the information I requested from the National Archives on my father’s military service. There wasn’t much because it appears that his files were burned in a fire in the Archives in 1973. They pieced together what little information they had. We had always heard that he drove a tank in the war. This is corroborated by many photos of him with his tank as well as stories he told to his family at the time. His Separation Qualification Record has him listed as a Motorcyclist, 378. It says that he “drove a motorcycle without side car to deliver messages and for patrol work. Drove cross country. Serviced motorcycle and made minor repairs. Used map and compass to travel cross country.” No mention of driving a tank but I am wondering whether the Motorcyclist 378 job might have been the one he had when he mustered out. He was back in the States for several months before he separated from the military. This is a new mystery. Did he drive a tank? Did he drive a motorcycle? Did he do both? We might never know. 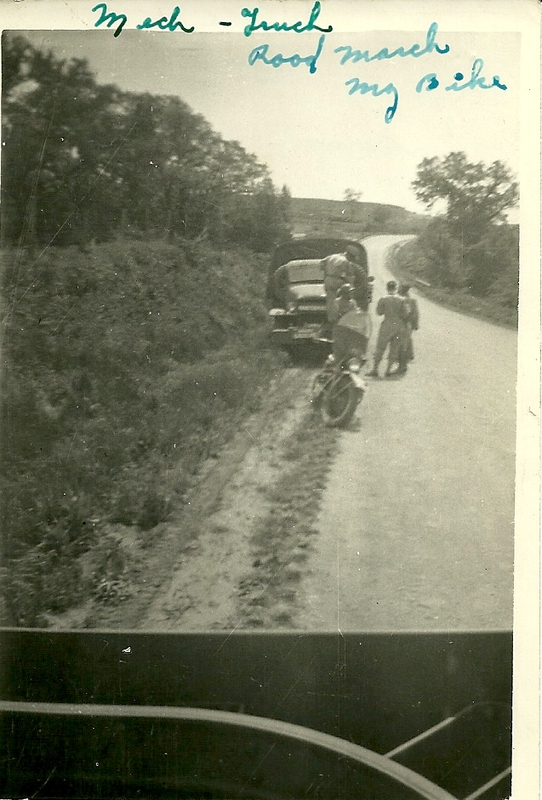 He sent this picture home showing a military truck and a motorcycle that he refers to as his. I wondered why he was allowed to take his personal motorcycle along on a military mission but I guess now I know. It wasn’t a personal motorcycle. It was a military one. This entry was posted in Stevens. Bookmark the permalink. 3 Responses to Stevens – Tank or Motorcycle? It is wonderful that they were about to give you something! Yes. When I first got the letter and read about the fire, I was sure that there would be no information. At least I got some.